Above: Could a puma be living in the Valley? I’d say it was extremely unlikely. 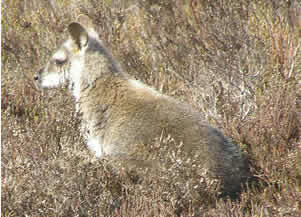 Above: A wallaby pictured in March 2009 near Lud’s Church by Andy Burton of Sheffield. Has anybody ever reported seeing a large cat, puma or jaguar roaming lose in the Goyt Valley – around 2004/5? I seem to recall hearing that one had been seen a few years back. But I can’t remember the details. If anyone can help, please leave a comment below, or send me a message. Sightings of large cats are quite common all over the country. My wife saw a black one in Lincolnshire a few years back, carrying a rabbit in its jaws. But whether it was just a large feral cat, or something more exotic, is open to question. Some friends of mine were shocked to see what looked like a small kangaroo close to The Roaches some years back. It transpired that it was a wallaby – a descendent of five that had escaped from a private zoo at Roaches Hall during World War II. Click here for more information about sightings of the Roaches wallabies, including one as recent as September last year. There’s even a couple of very shaky video clips.